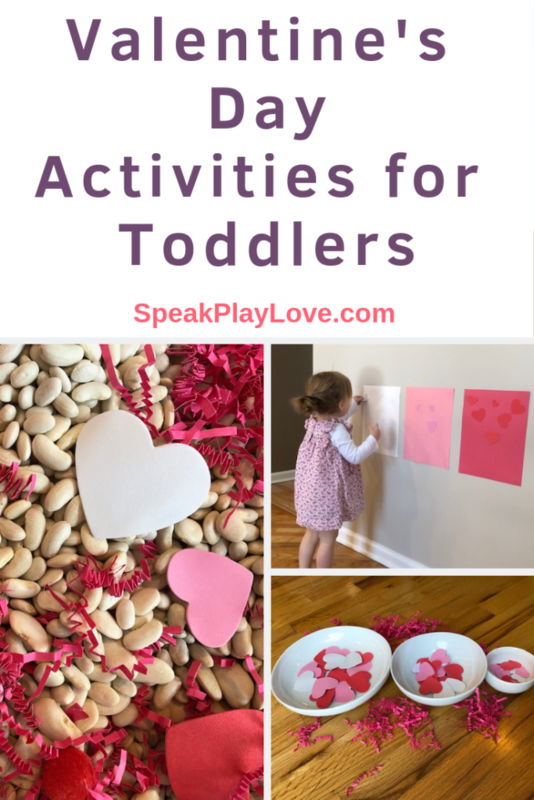 Valentine’s Day Activities for Toddlers | Speak. Play. Love. This post may contain affiliate links, which means we could receive a commission if you click a link and purchase something that we have recommended. While clicking these links won’t cost you any extra money, it will help us keep this site up and running! Thank you for your support! 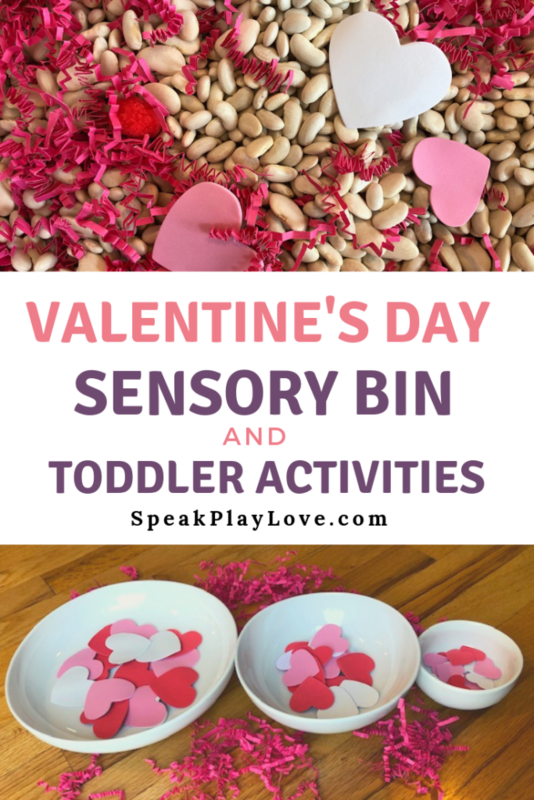 I wanted to let my little Valentine join in the festivities, but finding Valentine’s Day activities for toddlers isn’t so easy! 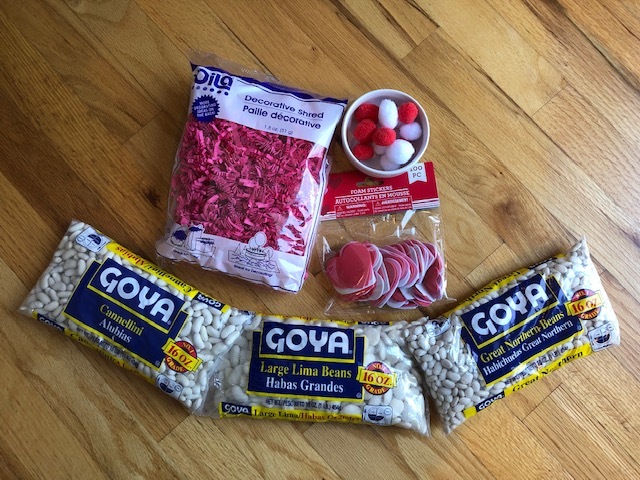 Of course she always loves a good sensory bin, so I got myself out the Dollar Tree and picked up some simple sensory bin fillers. 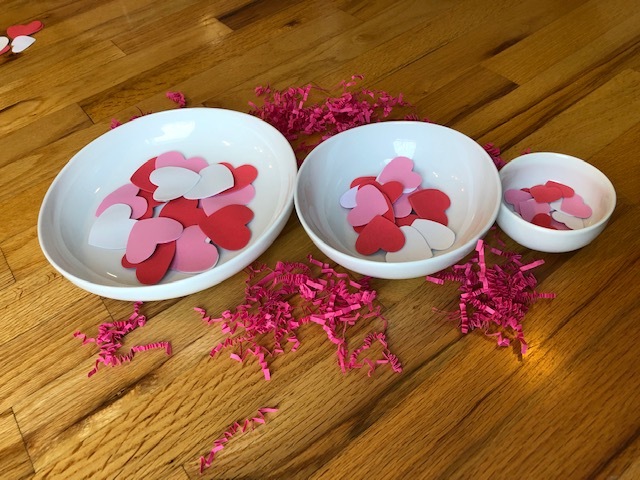 I also found some foam heart-shaped stickers that inspired a Valentine’s Day-themed sticker sort! 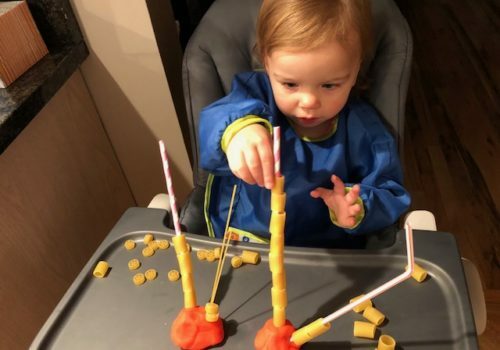 Toddlers have a natural inclination to sift, dig, dump and generally experience different sensations. I like to trade out different fillers and bases throughout the year to keep Sylvie engaged. 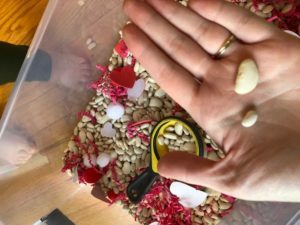 Whenever I introduce a new sensory bin, she is thrilled! 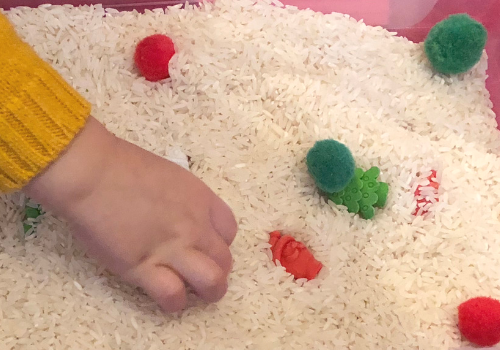 Sensory bins are great for interactive play as well as independent play (but I always stay close by make sure things stay tidy and that nothing goes in her mouth). My daughter put things in her mouth for what seemed like forever! Luckily, at nearly two she seems to have finally out grown it – yay! Since I wanted to keep with a Valentine’s Day color scheme, I wanted a white, pink or red filler. 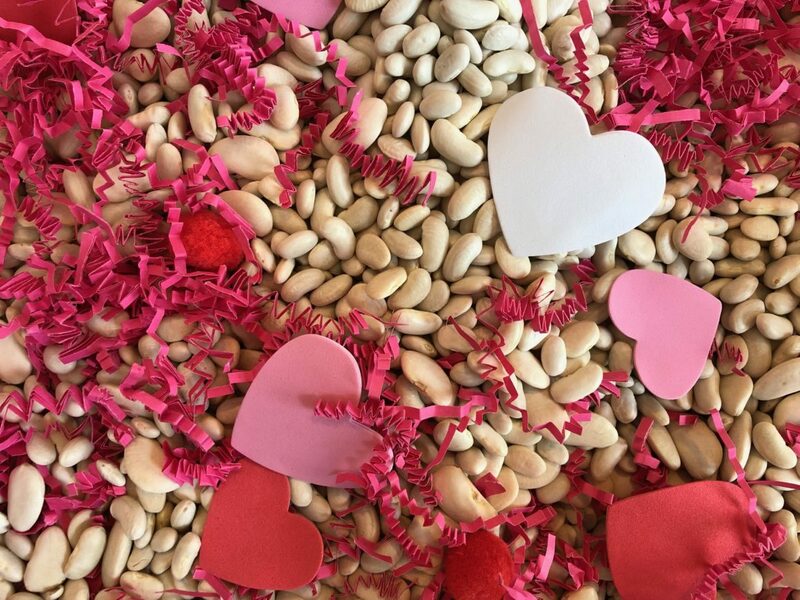 Ultimately I went with mix of pink crinkle-cut shredded paper and white beans in a variety of sizes (including baby Lima beans, large Lima beans, and Cannellini beans) so that I could work on sorting by size when Sylvie is ready for it! Am I missing any? Please drop a comment below if you have a great white/red/pink filler idea! 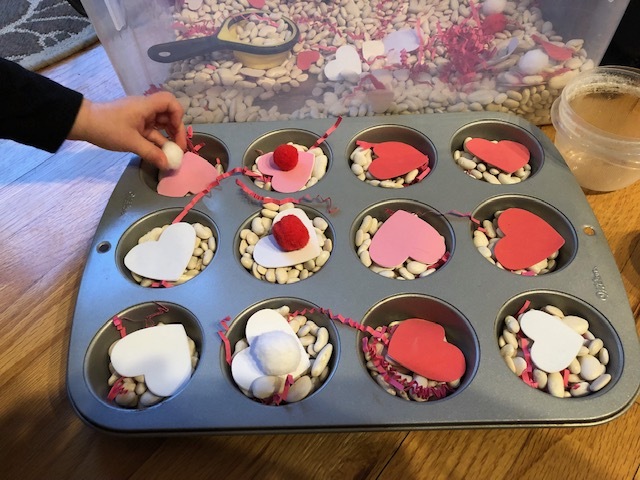 For items to hide in the Valentine’s Day sensory bin, I went with foam heart stickers (which we also used later in the sticker activity – see below) and pom-poms. 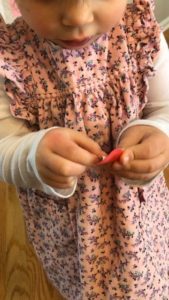 These items came in 2-3 colors and in 2-3 sizes, so they were perfect for early learning activities! 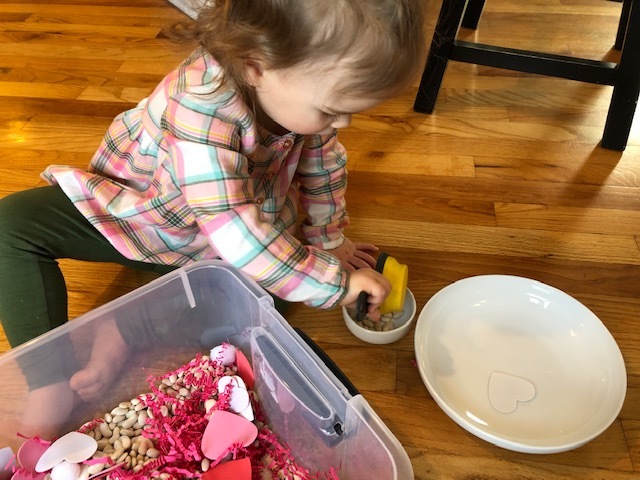 Sorting by Size or Color: If you have bowls or containers of different sizes, you can have your toddler sort right into those. 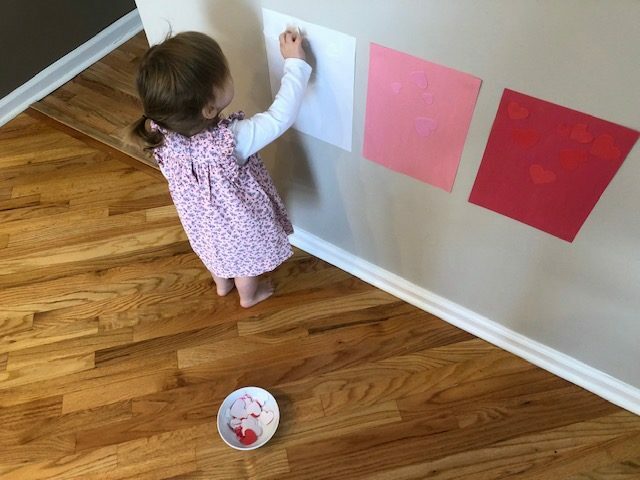 If not, try drawing a big, medium and little circle on three different pieces of construction paper and have her put the hearts or beans right in the circles. 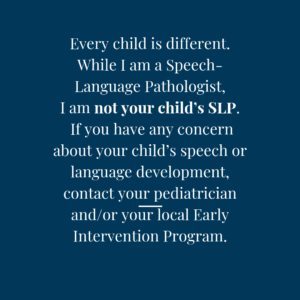 Tip: Try to narrate one, small level above from where your child is talking. 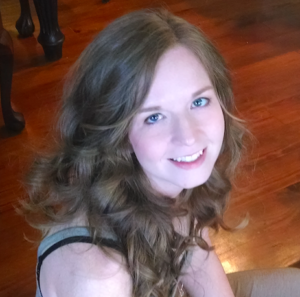 Click here to read more about how you can talk to your child to increase language development. 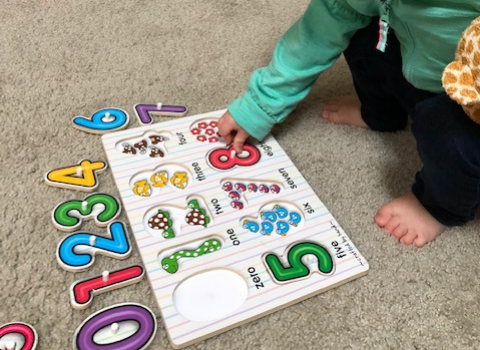 A few months ago, we tried Busy Toddler’s Sticker Sort activity (Here’s 13 More Sorting Activities to try) and it was a hit! So I adapted it a bit for Valentine’s Day by using Foam Heart Stickers. Set-Up: I used painter’s tape to stick the construction paper to the walls to make sure it didn’t damage the paint. Then I dumped the foam stickers in a bowl. Done! 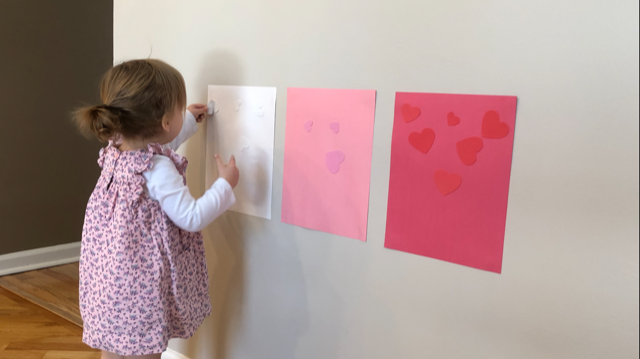 We got to work on learning different colors (pink, red, and white) plus some fine motor skills by pulling the paper back off the hearts. I had to get them started for her. If sorting/matching by colors is too easy, you could try sorting by size instead since foam stickers come in small, medium and large. I hope you enjoy these activities as much as we did! !